Nylon tubing is a popular choice for low pressure pneumatic applications because of its combination of flexibility and toughness. Nycoil uses a heat and light stabilized, very flexible compound that yields a quality tube. 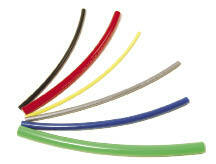 Nylon is the most recommended tubing material for all types of pneumatic circuits. A circuit designer could never get into trouble using Nylon tubing for pneumatic circuits. Due to its physical properties, Nylon is the number one choice for reliable connections with all types of fittings. 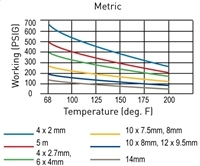 Nylon retains its performance integrity in elevated temperatures and generally, because of it's higher pressure and temperature characteristics, Nylon will have a greater flow passage than composite tubing made from other material with the same outside diameter. 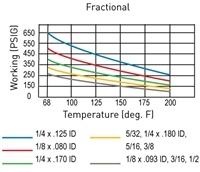 These factors should never be overlooked when designing pneumatic circuits.